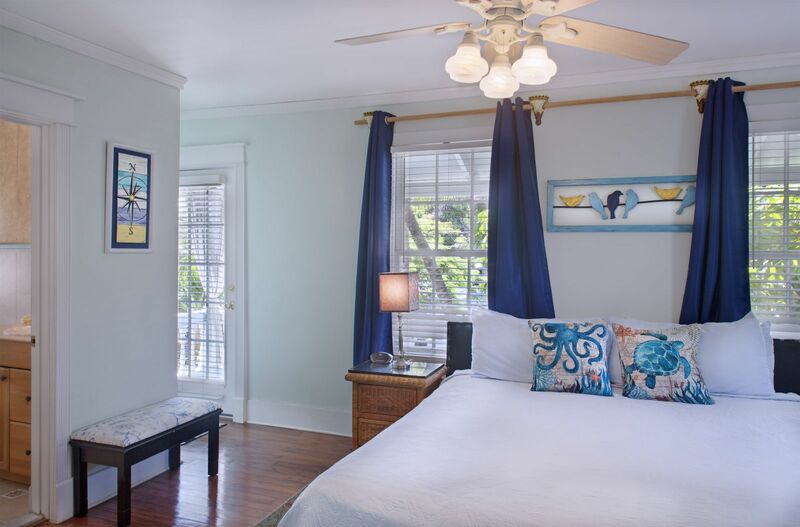 Our historic Key West inn offers charming, casual accommodations in 14 rooms and suites with intricate wooden headboards, classic Victorian wallpaper, new memory foam Serta mattresses and silk curtains. 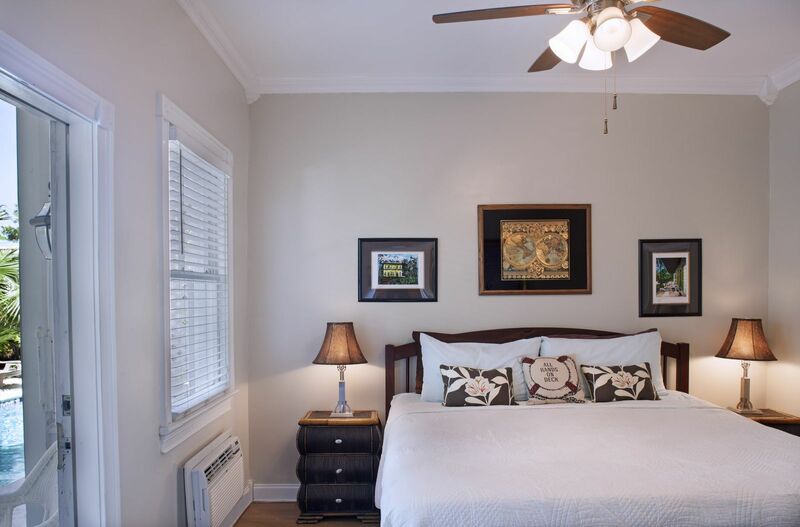 All rooms include amenities such as ceiling fans, free Wi-Fi, and cable TV. Kick back and relax in comfortable queen or king beds with plenty of pillows. 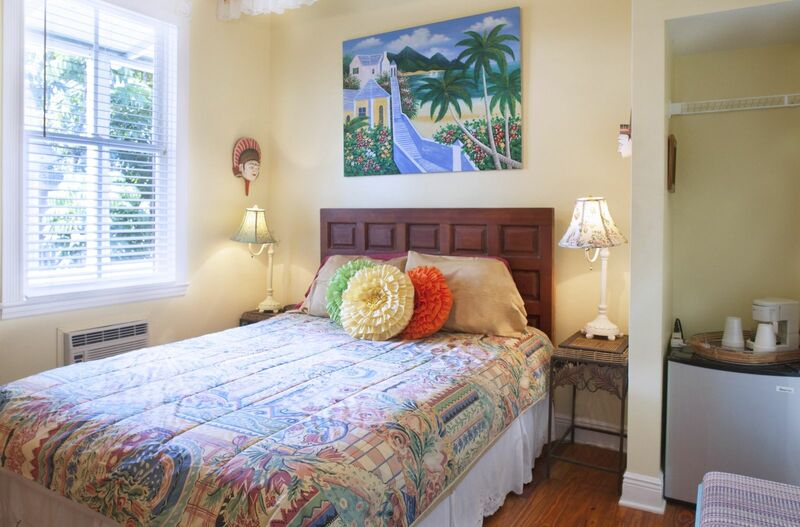 Coco Plum Inn is for guests 21 years of age and older. 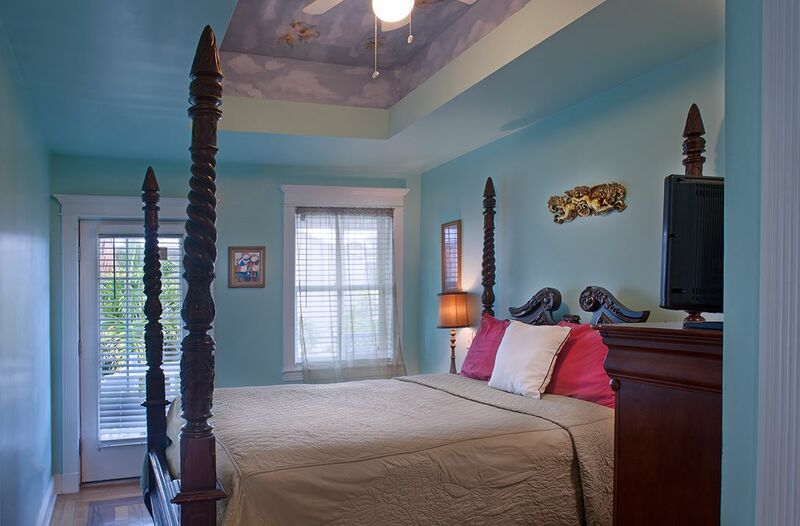 Plan a romantic weekend for two in Key West in our Super Deluxe King room. 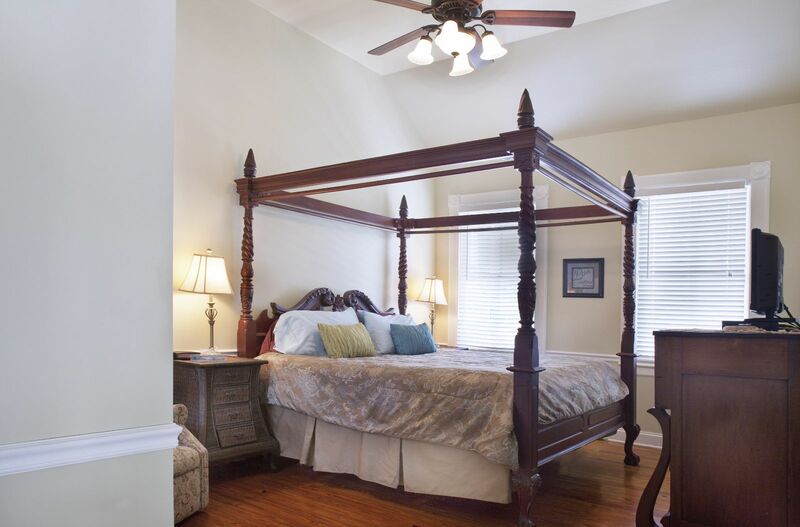 This room features a luxurious king bed with carved, wooden headboard and plenty of fluffy pillows. The bathroom includes a tiled walk-in shower. 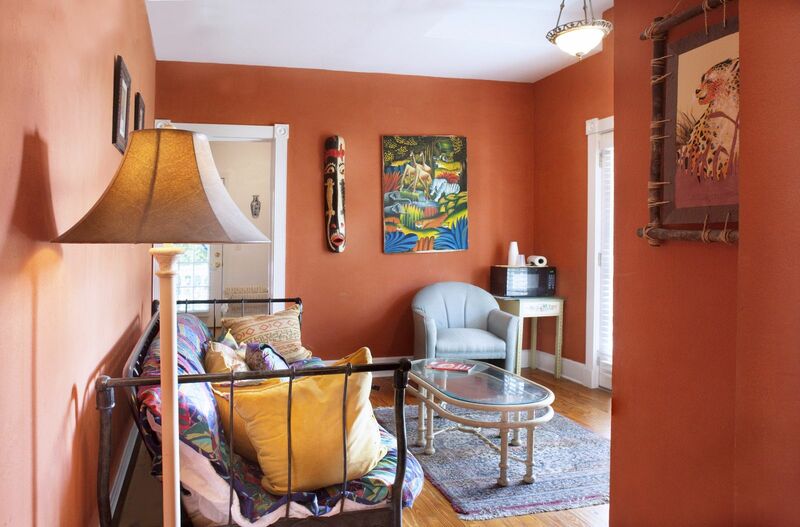 You’ll love relaxing in your sitting room or open front porch off your private entrance. 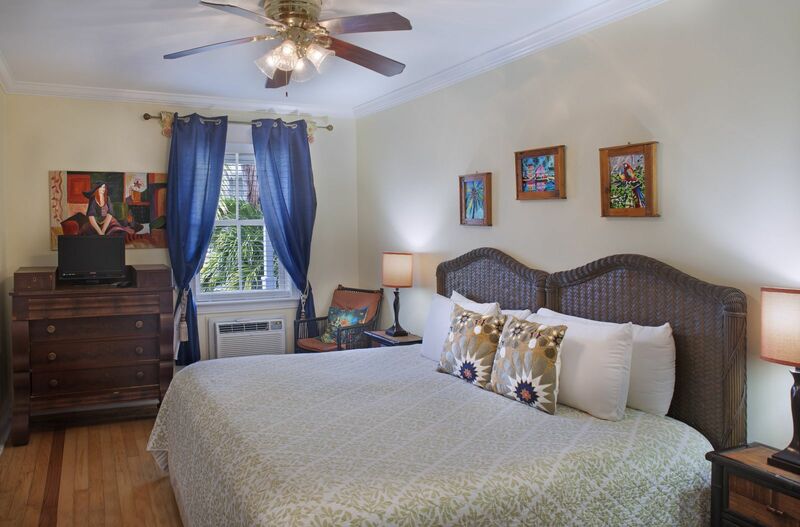 Find your perfect oasis near Key West's Duval Street in one of our four Deluxe King rooms. 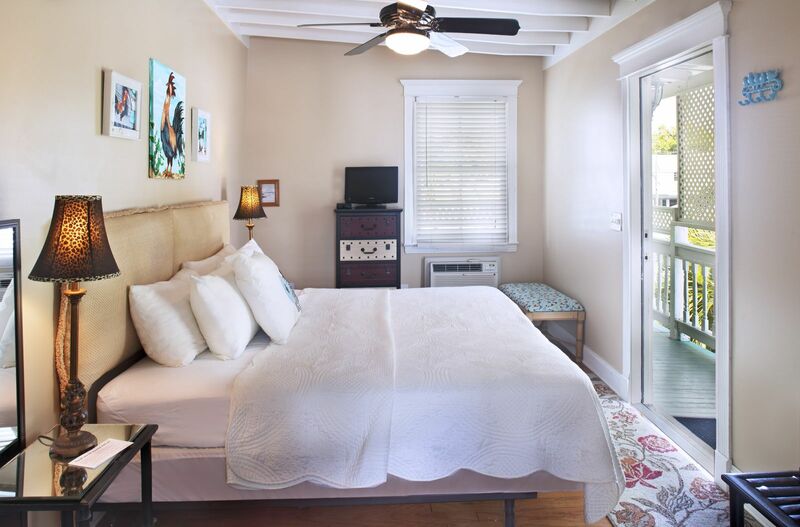 Each of these unique accommodations includes a huge king bed with lots of pillows along with individual features such as a four-poster bed, whirlpool bathtub, walk-in shower, or private porch. 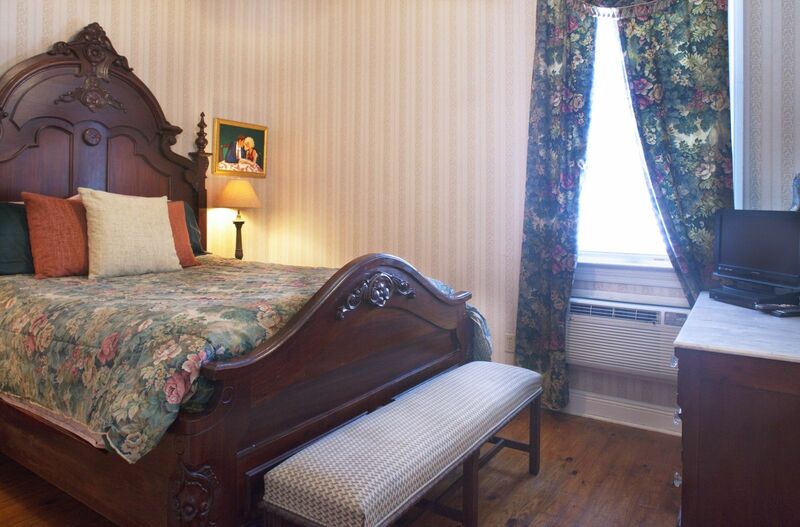 Our Standard King rooms include amenities such as a cable TV, microwave, Wi-Fi access, and a coffee maker. 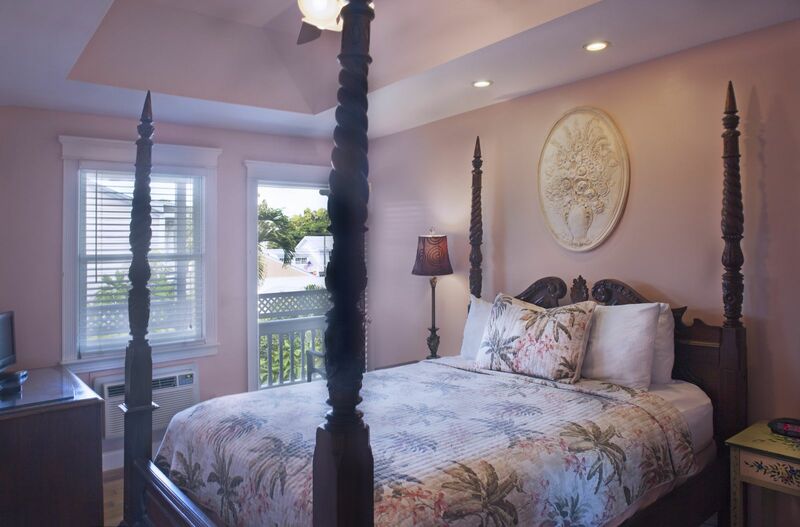 Find island-style king beds plus a tiled walk-in shower in two of our standard rooms. 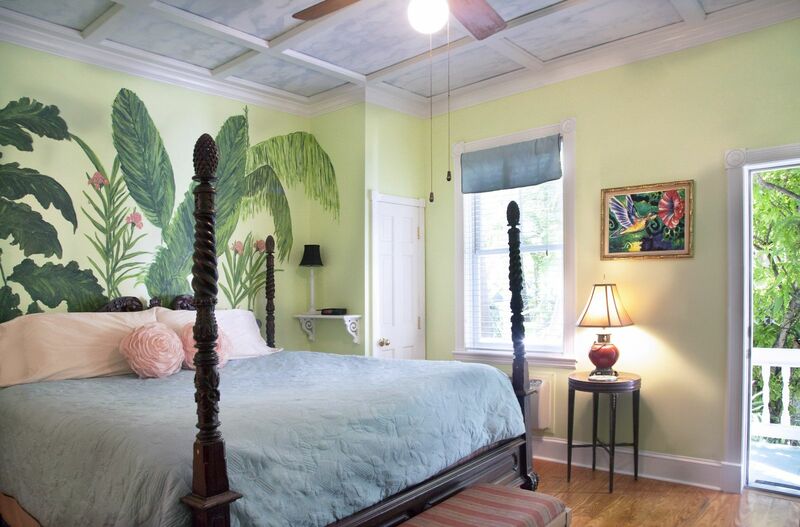 The third room sits poolside and includes an antique, four-poster king bed and a full tub with shower. 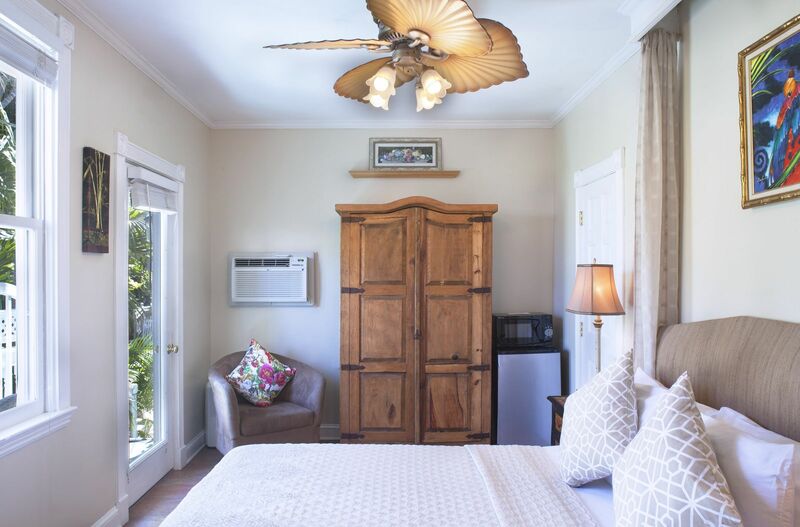 Relax island style in our Deluxe Queen rooms, one with rustic furnishings, a private porch with views of our gardens, and a two-person shower. 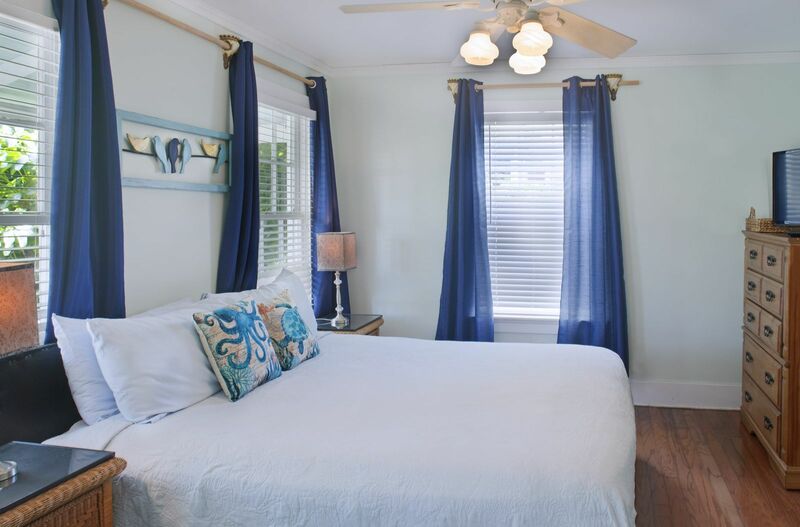 In the second room, which can form part of our three-bedroom suite, enjoy a private, upstairs porch overlooking the garden and pool, plus a large, walk-in shower. Cuddle up in intimate accommodations in our Standard Queen rooms, each with a unique four-poster, antique Victorian, or island-style bed. Each room features a private bath with shower, plus a tub in some rooms. The first two can be part of our three-bedroom suite, while the third includes a pool view. 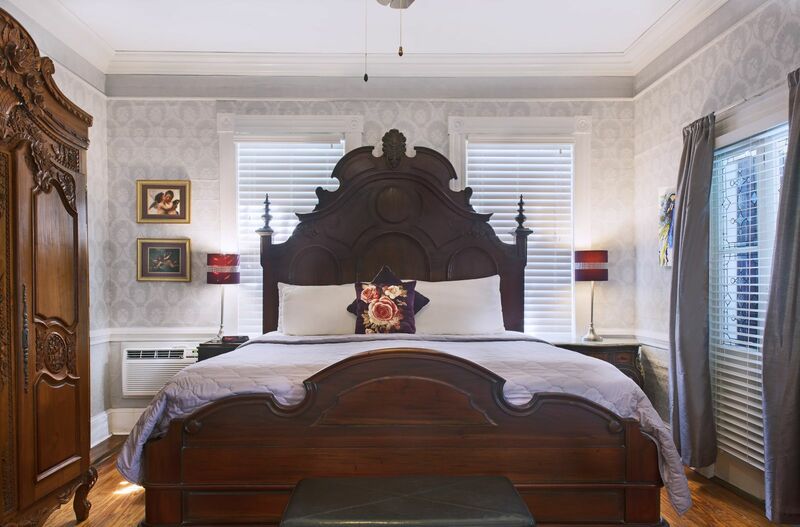 For larger groups, book our Three-Bedroom Suite, made up of a Deluxe Queen room with private porch and two of our Standard Queen rooms. Each of these rooms has a private bathroom and luxurious queen bed, and they all share a common living area. This suite has limited availability, so contact us today. 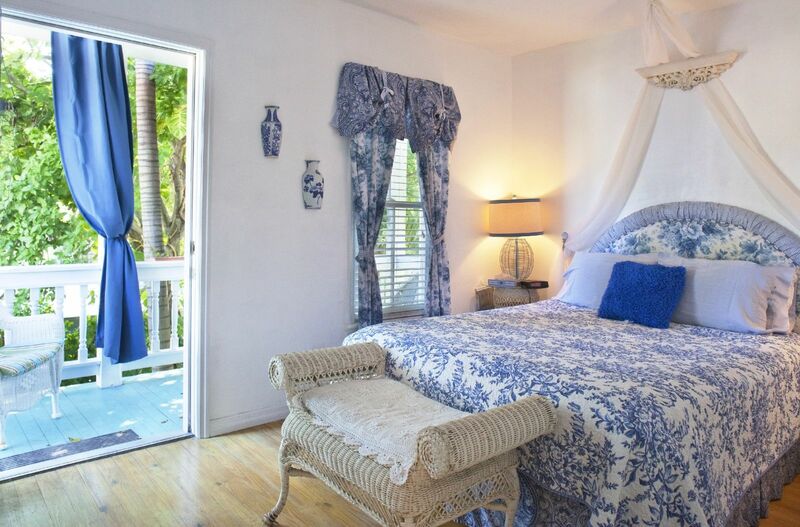 Coco Plum Inn uses all sorts of websites to help you find our Inn for your travels to Key West. We want you to know that we will always guarantee the best rate when you book directly through our website or through our reservation team members. If you feel you have found a better rate on another website, don’t hesitate to call us directly at (305) 295-2955 so we can extend our best rate to you. 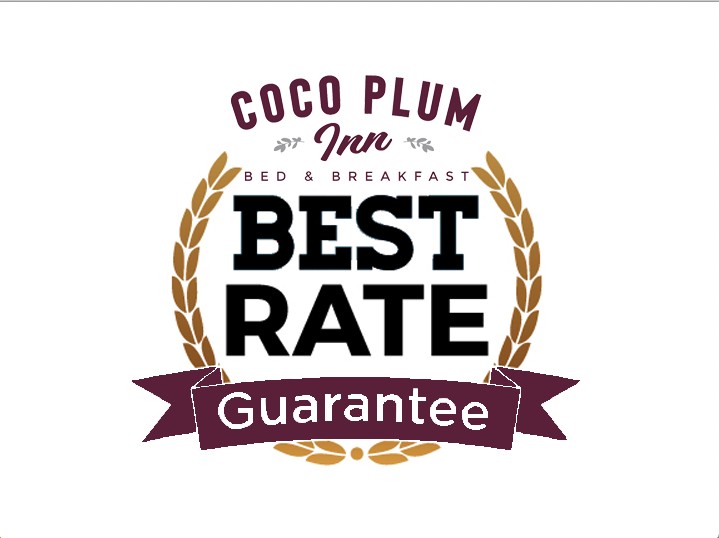 This is our guarantee that working directly with us is always the best way to reserve your stay at Coco Plum Inn. If there is a change in your plans for all or part of your stay, notify us at least 14 days prior to your arrival (30 to 60 days for holidays or special events such as Fantasy Fest) and we will refund your deposit less a $35 cancellation fee. If cancelled inside of two weeks (or 30-60 days which ever applies), your deposit is forfeited. Upon arrival, payment must be made in full for the agreed upon stay. If you wish to check out before your confirmed departure date, for whatever reason, your payment will not be refunded. We regret that there can be no exceptions to this policy.